Why Is Corned Beef Pink? Since corned beef is pink, how do you know if it’s fully cooked? And why is it pink anyway? Corned Beef and Cabbage with Carrots and Potatoes. Corned beef is a brined, tougher cut of meat that can be either the brisket, rump or round that many Americans traditionally like to eat on St. Patrick’s Day along with cabbage. 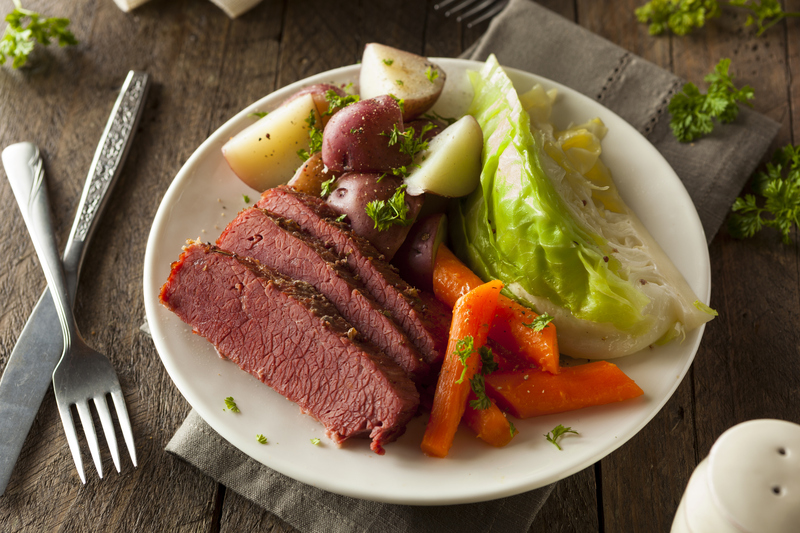 Corned beef got its name from the corning or curing process that was historically used to preserve meat before modern refrigeration . The beef cuts were dry-cured in coarse pellets of salt that were typically the size of a kernel of corn. The pellets were rubbed into the meat to keep it from spoiling. Hence the name “corned” beef. Today’s corned beef is now brined or cured using a salt water or sodium nitrite mixture, which fixes the pigment in the meat and causes it to be pink in color. That’s why corned beef remains pink after cooking, according to the U.S. Department of Agriculture Food Safety and Inspection Service. While many people think the color pink means that beef is not fully cooked, it’s important to note that this is not the case with corned beef. However, because corned beef is a tougher cut of meat, it does take longer to fully cook. Corned beef is safe to eat once its internal temperature has reached at least 145 degrees Fahrenheit and has stood for about 20 minutes after removing it from heat, USDA recommends. If you purchase corned beef, it can be safely stored in a refrigerator for up to 7 days past its sell-by date. If your package has a use-by date, the meat can be stored unopened in the refrigerator until that date, USDA recommends. In the oven set at 350 degrees, with the brisket fat-side up. The meat should be slightly covered with about 1 inch of water, with the container covered throughout the cooking time. Allow about 1 hour per pound. On the stove with the brisket fat-side up in a large pot covered with water. Bring the water to a boil, then reduce the heat and simmer, allowing about 1 hour per pound. Vegetables may be added during the last 20 to 30 minutes of cooking. In a slow cooker. If you plan to use vegetables such as potatoes and carrots, put them in the bottom of the slow cooker and then place the brisket on top of the vegetables. Add about enough water to cover the meat and cook on the high setting for the first hour of cooking. Then cook for 10 to 12 hours on the low setting or 5 to 6 hours on high. Cabbage wedges may be added on top of the brisket during the last 3 hours of cooking. In a microwave oven, allowing 20 to 30 minutes of cooking time per pound. Place brisket in a large casserole dish and add enough water to cover the meat. Cover with a lid or vented plastic wrap and microwave on medium-low for half the estimated time. Turn the meat over and rotate the dish. Microwave on high for the remainder of time or until fork tender. Vegetables may be added during the final 30 minutes of cooking. Leftover corned beef should be refrigerated within 2 hours of cooking and can be eaten safely for up to 4 days. Frozen leftover corned beef can safely be eaten for up to 3 months, USDA says. To reheat leftover corned beef, the meat should be brought up to 165 degrees before eating.